Idaho Falls continues to grow. There are listings, listed by our agents here at The Group Real Estate, all over the place nowadays, propelling the small town of Idaho Falls into a bigger “city,” and one of the main attractions we have here in Idaho Falls is the Museum of Idaho. 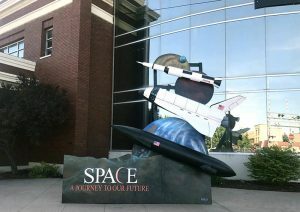 Right now, going on at the Museum of Idaho in Idaho Falls, is the Space: A Journey to our Future exhibit. Take a fun spin in a human-powered centrifuge, come and put your hands on actual meteorite from the Moon and Mars, and come and experience the use of the most advanced interactive exhibits and state of the art projection and audio technology, which brings space to life. This is in full collaboration with NASA and NASA has a hand in bringing this amazing space experience right here to Idaho Falls! This is one of the biggest exhibits that the Museum of Idaho has put on. You will be indulged in spectacular exhibits on space exploration that has ever before been seen. If you are the type of person who loves clear nights and the ability to go out, look up and enjoy the Milky Way as it splashes across the sky, this is the exhibit for you. Those clear nights showcase a plethora of stars and a splatter of bright light that leaves us wondering what is going on so far away from us. This exhibit lends itself to answering this question. There is so much mystery that lies in front of our eyes, as our minds wander to the expansiveness of the universe above us. 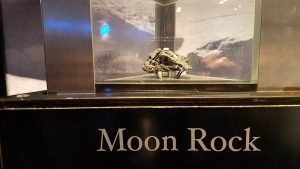 The Museum of Idaho provides such a unique opportunity to experience our Solar System and the tech that is used to explore the next frontier. What is so wonderful about space, or space exploration, is that each and everyone of us has had the thought of wanting to experience space. There have been so many TV shows and movies made about space, the fears of it, the excitements, the future, what it holds, etc. Star Trek let us see space, space ships, alien life and the idea of a future so many years ago. It paved the mind and the imagination of what truly we would see, or experience, if we went to space, or to other planets and stars. The intrigue that our favorite science fiction stories, movies and TV shows gave us when we were kids has stuck with us, and our society, for years and years. It’s why the phenomena of Start Trek and Star Wars have lived on through multiple generations. What is space? What is up there? How is it possible that what we are seeing in stars is a light that is exploding millions of miles, and years away? One of the most amazing attractions within the exhibit is the 360-degree theater where you are able to look far into the future of space exploration. This leads to where you get to have fun seeing how much you would weigh if you were bounding on the Moon or walking in the red dirt on Mars. 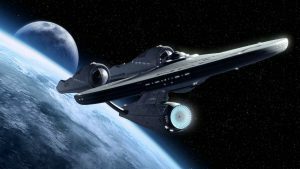 Many of us don’t know the fleet of star ships and satellites that are up there, actually doing the things we always imagined from our favorite episodes of Star Trek. Here we learn about all of the star ships that are up there right now and what they are doing. There is also the opportunity to build a space station that would be manned on Mars, how it would look, how it would operate and what it would be used for. Remember, as new homes are being listed all over Idaho Falls, one of the many reasons for this, is to experience the Museum of Idaho. A place that not only gives a new exhibit every couple of months, but a Museum that gives us a great run down of Idaho Falls and where it came from, the humble beginnings, the history and where we will be able to go into the New Frontier. Come to Old Town Idaho Falls and take the leap into space with your friends, family, and those who live here in Idaho Falls.